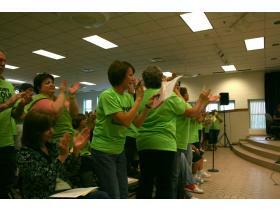 Lincoln paraprofessionals stand and cheer as Superintendent Lynn Cleary announces jobs will not be cut as planned. Jun. 9, 2009 · 1:05 p.m.
Sighs of relief rang through the cafeteria as the Lincoln Consolidated superintendent announced some jobs would be saved that were originally slated for the chopping block at Monday evening’s meeting. Superintendent Lynn Cleary said last-minute negotiations with employees removed the options to cut dozens of full-time teaching aides, maintenance employees and other jobs from a list of proposed budget cuts presented at Monday’s meeting. However, she also warned more concessions and tough cuts would need to be made in the future. “You still need to pick up the shovel because we have holes that aren’t filled,” she said to the room packed with nearly 200 school employees. The district is facing a $1.21 million deficit due to enrollment loss, drops in state-shared revenue and decreased tax revenue coupled with increasing district costs. According the district’s budget projections, the deficit could grow to more than $5 million by the end of 2011. Cleary said pending per-pupil reductions could be $95 for the 2009-10 year resulting in a $460,000 loss. More per-pupil cuts could result in nearly $1 million loss in the 2010-11 year and about $2.4 million in the 2011-12 year. She said the district could use some federal stimulus money to cover some costs in 2009-10. However, she also said the federal government plans to cut Title 1 funding by 10 percent and special education by 17.6 percent. Nearly $300,000 in cuts will still be realized including elimination of the fifth grade band, elimination of a transportation mechanic and the elimination of an assistant principal position. If additional concessions are made the board will vote on them at its June 22 meeting. Negotiations between the district and paraprofessional representatives will resume Thursday. The board will vote on budget amendments at its June 22 meeting.